Look What My Mum Made Me! It's been a while since I've had a finish to show, although I do have quite a few small pieces still waiting to be made up, so I really must crack on with them sometime soon! I even have a little Christmas stitching from last year that still needs putting together! I've only done a little stitching recently as Colin has been home on his time off and I never get a lot done then as we make the most of enjoying our time together doing other things. My sister Debra has also been over from South Africa and staying close by, so of course I've wanted to enjoy time with her when I could too! 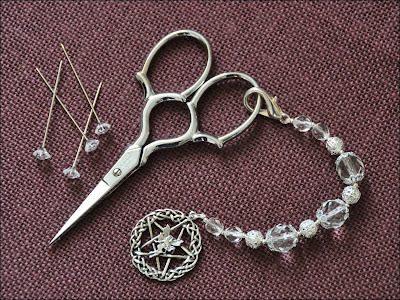 Anyway, as I have no stitchy pics I thought I would show you this gorgeous beaded scissors fob that my Mum made for me. She has actually made four of these, one for both of my sisters Debra and Sarah, and of course one for herself! The beads are all swarovski crystal and silver and the lobster claw and fairy charm are silver too. Thank you for making this for me Mum, I absolutely love it! Thank you so much to those who commented on my previous post, for help choosing a new sewing machine. Still undecided but I did find it really interesting and enjoyed reading what you all had to say, so thank you again! Once I have my new sewing machine I will post a picture so that you can see which one I eventually decided on! I really need some help with choosing my new sewing machine! I thought I had made my decision a few months ago but I'm undecided yet again! I have a big birthday coming up in December (my 50th, but shhhh, don't tell anyone) and have told DH Colin that he is going to be buying me a shiny new sewing machine to replace my 30 year old Singer that gave up on me well over a year ago! I'm not that experienced with a sewing machine, up to now only really using it for straight stitch and zigzag for taking up hems (DH and I are both shorties) and making a few little pillows and wall hangings. I would really like to have one that I can learn to do lots of exciting new things on. My problem is that I can't decide between a Bernina or a Janome and searching the web have read great reviews on both. I would really appreciate any help and advice as I have now totally confused myself and need to make a final decision before Colin arrives back home at the end of October, as I will probably have to buy it before he is next due to go away again.